Tom Demarker developed the Demarker technical analysis indicator, which is very similar to RSI technical analysis indicator. Demarker is belongs to the Oscillators family because it is a range bound indicator. It moves within the range of 0-100. Along the post you will be introduced with the forex technical analysis with Demarker. Two levels 30% and 70% are leveled in the indicator window. A reading by Demarker below 30% indicates the oversold condition, and suggests to place a buy order. 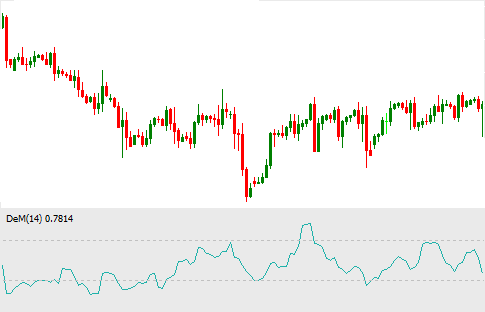 On the other side, a reading above 70% indicates the overbought condition, and suggests to place a sell order. Some traders apply the Demarker, RSI and Moving Average indicator in a single indicator platform to get the entry and exit signals. But I do not think it as a effective technical analysis technique. The divergence and convergence technique can be applied on Demarker technical indicator to find reliable entry and exit signals. This is the most effective use of this indicator. Very few traders use this indicator because RSI is the best alternative of this indicator.This are the technique of trading forex with Demarker technical analysis indicator. If you have any suggestions, please drop into the comment section below.